Let's be clear about something here before we begin: everybody is an expert (or "expert enough") in at least one body of knowledge. It doesn't matter what it is. Maybe you know how to sing a little bit better than everybody else, maybe you know your way around the basketball court, maybe have discovered a way of running a little bit faster, or maybe you know how to make money with Twitter or Facebook. We can all agree on this because not all of us have the same experiences. Not all of us have had the same things happen to us. It is precisely this difference in experience levels that make hanging out with our friends and family members so rich and rewarding. We get to look at the world from many different eyes and different perspectives. We also get to explore it through our shared stories at different times. Since this is the case, did you know that people might actually pay for your expertise? 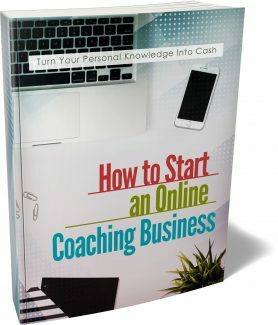 This is the reason why the online coaching business is a large multimillion dollar industry. People all over the world are interested in what other people have to teach them. In fact, you only need to look at platforms like Udemy and the huge following of tutorial channels on YouTube to get a rough idea of the demand out there. As I've mentioned earlier, people simply do not have the time to chase after information and then filter that material. They really cannot be bothered. Maybe they're too busy, maybe they feel that they do not have the proper expertise or the background to do it. Whatever the case may be, they would rather go to somebody who is so passionate about a specific body of knowledge that they have put in the time, effort and focus in compiling this information from third party sources. Think of it like going to a specialized librarian. If you're looking to, let's say, practice permaculture in a tropical setting, you can wrack your brains trying to go through all sorts of online libraries, chase down all sorts of arcane or obscure materials, or you can go to somebody who has an ebook or online course focused on that specific topic. When you sell your expertise in the form of a course, an online program, or some sort of book, you get paid to talk about stuff that makes you curious or which pushes you to investigate. This is actually one of the most fulfilling and gratifying benefits of selling your expertise. You're not being paid to push a button. You're not being paid to do something that you've done millions of times before and which feels like it drains your soul. Instead, you are being paid to really pursue your passions. One of the most fulfilling things people can do on this planet is to interact with each other where their understanding is not only challenged, but enhanced. Let me tell you, when it comes to hanging out with other people, one of the most satisfying and rewarding experiences you could get is when you get that "aha" moment. When somebody shares something with you that you didn't know before, or shared information with you that enabled you to realize something that you did not know before, the sense of discovery and putting pieces together in your mind is a very positive experience. It excites a lot of people. And you get this opportunity when you get paid for other people to pick your brain. They ask you question after question, and it's your job to basically take those questions and mentally pick them apart and come up with an answer. You are not only challenging your present knowledge, but you're also being paid to think. Let's face it, not all of us are engaged at this level. Not all of us are getting paid to achieve that "aha" moment. You're basically getting money to develop as a human being. What's not to love? When you work for somebody else, generally speaking, you have to sell your time for money. That's the exchange. You agree to show up at a certain time, at a certain place, to do certain things, and in exchange for that, you get paid. You trade your time for money. This is a serious problem because, obviously, there's only one of you. You cannot be in two places at one time. Also, there are only 24 hours in a day. It's not like you have an infinite inventory of time to sell at any given day. It is no surprise that a lot of people burn out from active income. That's what this is. When you trade your time for money, you are engaged in active income. If you stop taking action, you stop earning. Passive income works the other way. You work once or you work very little, and then the asset that you create continues to generate money. In the brick and mortar world, a key example of a passive income is when you buy an apartment complex. You obviously have to work for the money to afford that complex, but once you bought it, every single month, your tenants have to come up with the rent. You just sit back and wait for the rent to come in. From time to time, the property management company sends people out to make sure that the building is in good working order. But for the most part, you don't have to lift a finger to earn the rent money that comes in like clockwork every single month. That is the power of passive income. The good news is, when you sell your expertise, the majority of these business models are passive in nature. You don't have to be there actively coaching people on a one to one basis. You can write a book, or you can shoot videos that people can view at their convenience. You can show up at a webinar and be recorded.